Many federal employees enjoy talking about retiring before age 65, but the fact is that many of them are working past age 65. They are not alone. According to the Bureau of Labor Statistics, 18.8 percent of Americans age 65 and older reported being employed. The number has increased steadily since 2000 and in 2017 represented nearly nine million people. Federal employees are included in this nine million group. Social Security represents an important part of every federal employee’s future retirement income, especially those employees who are covered by the Federal Employees Retirement System (FERS). But even for those employees covered by the Civil Service Retirement System (CSRS) (who do not pay into Social Security while working under CSRS) Social Security benefits can be an important part of their retirement. This is because a minimum of monthly Social Security retirement monthly benefits can be sufficient to pay most, if not all, of the monthly Medicare Part B premium. Both CSRS and FERS employees have the advantage of receiving throughout their retirement a defined benefit pension plan in the form of a CSRS or a FERS annuity that provides a steady monthly income stream, the equivalent of which most likely is not available to employees working in private industry. CSRS and FERS annuities are backed by the US government and are not affected by stock market moves. There is no risk of outliving one’s CSRS or FERS annuity. This risk – longevity risk- is a risk associated with the Thrift Savings Plan (TSP) which is a defined contribution plan. Social Security provides a guaranteed income stream that an individual also cannot outlive. Regular cost-of-living adjustments (COLAs) help CSRS and FERS annuity and Social Security benefits keep pace with inflation. Having a Social Security claiming strategy is extremely important for every Social Security recipient. A claiming strategy is more challenging if one is still working, is or was married, or is a widow/widower. The right strategy can add thousands of dollars to an individual’s guaranteed Social Security monthly income. Married employees in particular should pay attention to the timing of each spouse’s claim and take advantage of spousal as well as individual benefits as a way to maximize lifetime Social Security benefits. CSRS and CSRS Offset employees who continue to work in federal service should give particular attention to claiming spousal, ex-spousal, or widow/widower benefits because of the two Social Security offsets that affect CSRS annuitants. Choosing when to start claiming Social Security benefits is an individual decision and under certain circumstances it makes sense for some individuals to start receiving benefits as early as possible. For example, individuals with serious health issues that shorten their life expectancy should consider enrolling as early as possible in social Security. Parents of disabled children may claim early in order to get benefits for a child. Claimants may be eligible to begin taking Social Security benefits at the age of 62. But should they? That is an important question for their future financial security. 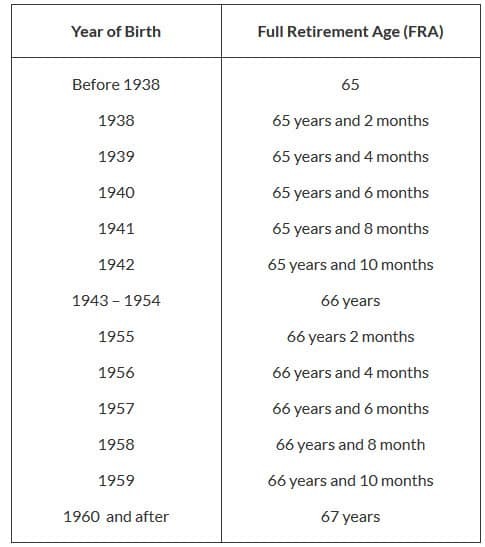 As shown in the following table, there is a big difference between the benefits paid to someone who receives Social Security benefits starting at age 62 and benefits paid to those who wait until full retirement age, or until age 70. As shown in the table above, there is a major difference between the benefits paid to someone who takes Social Security early and benefits paid to those who wait until FRA or until age 70. In this example, an individual who starts receiving Social Security benefits at age 62 would forfeit as much as $613 per month compared with the benefits he or she would have received had he or she started at the FRA of 66 years and 2 months, and as much as $1,365 per month had he or she started receiving benefits at the age of 70. There is another important consideration, namely the “earnings” test, for those individuals younger than FRA in 2017 (those individuals born in 1952 through 1955) receiving Social Security benefits and who continue to work. The Social Security Administration (SSA) has a limit for individuals younger than their FRA, receiving their Social Security benefits, and working as to how much the individual can earn without losing any of their benefits. During 2017, someone between age 62 and 65 can earn a maximum $16,790 without losing benefits. For every $2 the individual earns above $16,790, the SSA will reduce the individual’s Social Security benefits by $1. That would mean if the individual earned more than $50,370 during 2017, he or she would lose all of his or her benefits for 2017. There is a separate “earnings” test for individual in the year they become FRA. During 2017, those individuals born during 1951 reach age 66 which is their FRA. These individuals have an “earnings” test as follows: Until the month the individual reaches his or her FRA, the individual can earn no more than $44,880. For every $3 the individual earns above $44,880, the SSA will withhold $1 in benefits. Once an individual reaches the month of his or her FRA, the “earnings” test ends. That means an individual can receive Social Security benefits, work and earn as much as he or she wants without losing any of his or her Social Security benefits. 1. For those employees who will be 65 year old during 2017 (those born during 1952) and who continue to work should not elect to receive Social Security benefits during 2017 because of the “earnings” test. 2. For those employees who are 66 or older during 2017 and have reached their FRA, they should elect to receive their Social Security benefits only if they need the additional income. Otherwise, they are best off delaying their Social Security benefits until age 70 in order to receive the delayed retirement credits. 3. There is one exception for a federal employee who is reaching FRA during 2017 to delay the start of Social Security benefits. A CSRS or CSRS Offset employee who has reached FRA and continues working in federal service should receive his or her benefits. This is because while the employee continues in federal service, his or her Social Security benefits are not subject to the Windfall Elimination Provision (WEP). The WEP reduces benefits on average of 40 to 50 percent but applies only to CSRS annuitants and not to CSRS employees. 1. Spousal benefits. A lower earning spouse may be eligible for a benefit of as much as half of their higher earning spouse’s benefit if the higher earning spouse’s benefits are more than twice the lower earning spouse’s benefits. A 2015 change in the law eliminated some spousal benefit claiming strategies for those born on or after Jan. 2, 1954. A CSRS employee married to a spouse who has paid into Social Security would be an example of a ‘lower earning” spouse. However, a CSRS annuitant would most likely not be able to receive a spousal Social Security benefit because of the Government Pension Offset (GPO) which reduces – most likely eliminates – any type of spousal Social Security benefit. Once again, a CSRS-covered employee married to someone with larger Social Security benefits is encouraged to receive those benefits while continuing to work in federal service. 2. Employees who are divorced or widowed and were married for at least 10 years may have the opportunity to claim benefits on an ex-spouse’s record, even if the ex-spouse has remarried. A man or woman claiming spousal benefits on his or her ex-spouse’s record must be unmarried and age 62 or older. The benefit she is entitled to receive through her own record is less than the benefit she receives based on her ex-spouse’s Social Security. If he or she claims at FRA, then the benefit will be one-half of his or her former spouse’s retirement benefit amount. His or her benefits would not include any delayed retirement credits that an ex-spouse may have received. Surviving spouses also are entitled to receive benefits on a former spouse’s record. Surviving spouses can claim as early as the age of 60 for reduced benefits or receive full benefits at FRA. Once again, a divorced CSRS employee would be eligible for these benefits but only if he or she is working in federal service. Once a CSRS employee retires and becomes a CSRS annuitant, the GPO will most likely eliminate any type of Social Security benefit from the ex-spouse, widow or widower.